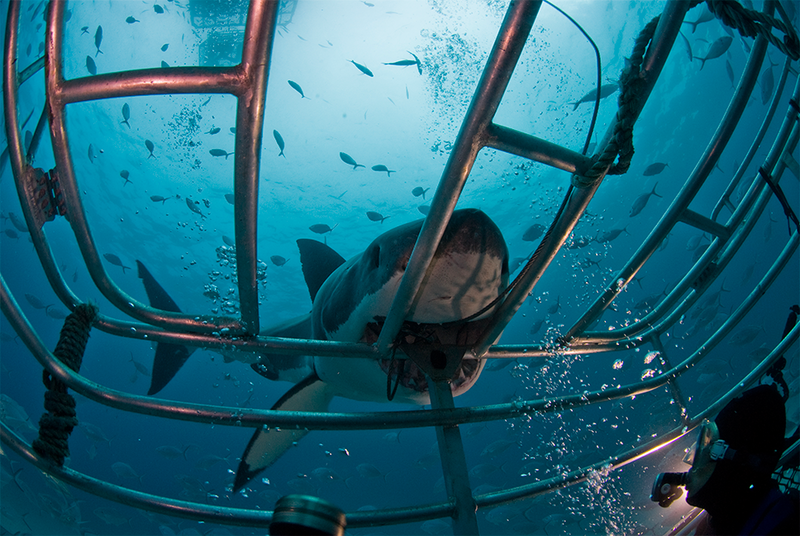 Taking The Plunge With Great White Sharks! We were a crew of ten. Seven divers from our local dive shop ‘Sundive’, a Japanese photographer from ‘Diver’ magazine and two lads who had booked their trip before even starting their open water course – what a way to start your diving career! Two flights and an interesting cab ride with the charismatic Frank and we found ourselves hunkered down with a hearty meal and a few beers in the Marina Hotel, waiting to be met by the Rodney Fox Shark Dive crew. Sadly the weather wasn’t the best and diving in four metre swells and 50kph winds isn’t ideal, so we headed to Tumby Bay to dive with the leafy sea dragons. Not quite great whites but certainly just as beautiful! Once we had acclimatised ourselves to the 11 degree water it was time to motor the eight hours out to the North Neptune Islands – next stop Antarctica! 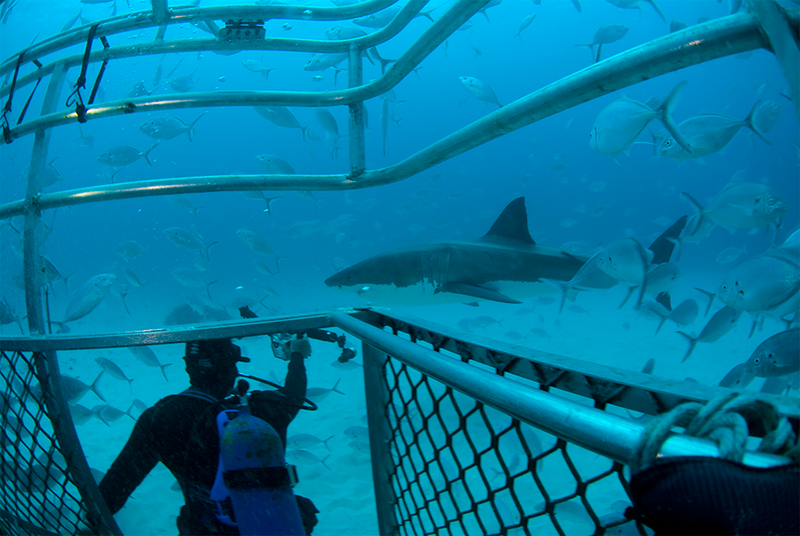 Our first days diving was a little bumpy but the sharks more than made up for it. They were every bit as incredible as I thought they would be, however (and this makes me hang my head in shame a little as I should have known better) I was surprised at their gentleness. I know sharks in general are not crazed man eating machines, I know they are misconstrued in the media and yet here I was getting a reality check watching these five metre fish swim calmly and serenely around me. We saw 16 great whites in total, both male and female, juvenile, sub adults and the ‘Super Sharks’ which are the big boys and girls in the five metre mark. We were able to identify particular sharks that we had seen: Kiwi, Moo, Rascal and Imax being just some. It was an amazing adventure and we are all thankful for the crew of Rodney Fox Shark Dive. I would certainly recommend this trip to anyone – diver or not, and for now I hope you enjoy the images below and my article in the next issue of 72&Rising. 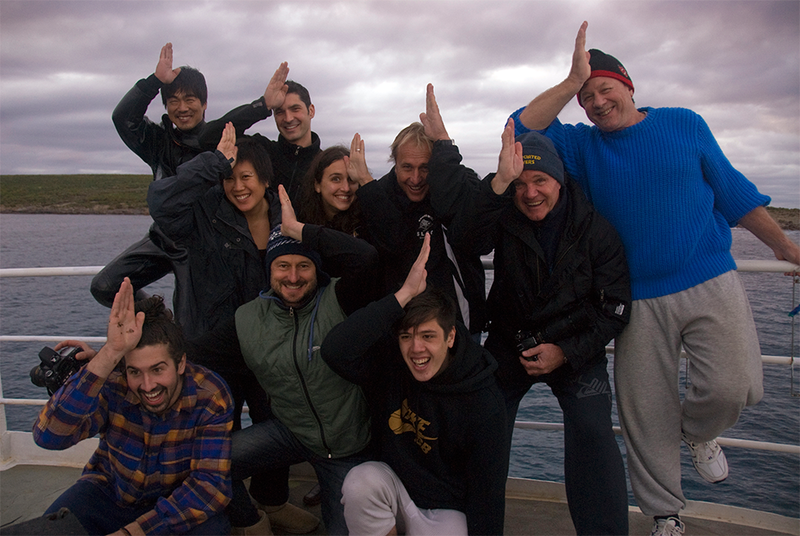 A motley looking crew on the hunt for some big sharks…. North Neptune Islands. 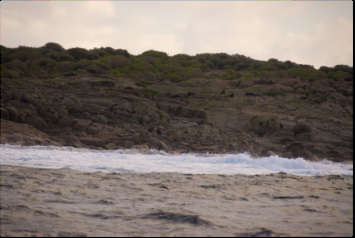 The resident seal colony that lures the great white sharks to this location year round. 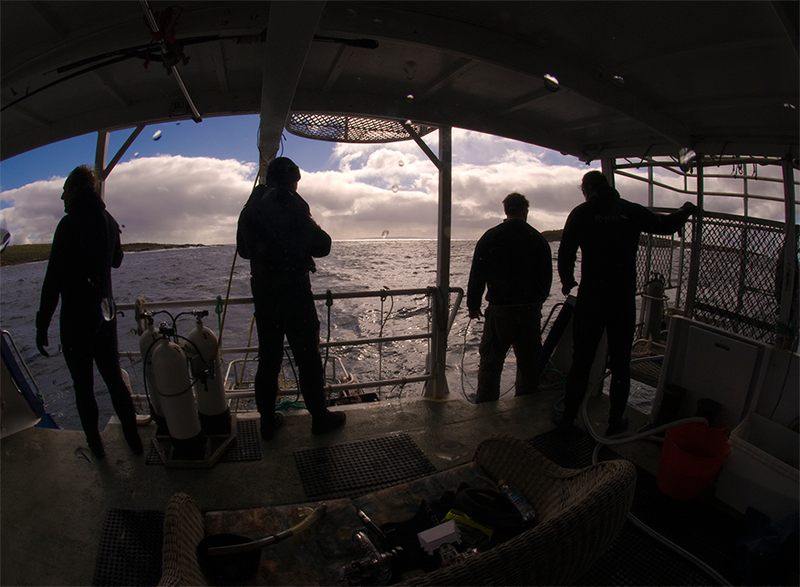 Upon arrival, excitement starts to mount and divers start to emerge from the warmth below decks, eager to start scanning the horizon for the first glimpses of a shark. Sea conditions were fairly poor on our arrival. Captain Ned and Andrew had to focus on locating the best anchorage. The burley flag is raised signalling to other ocean goers that chum is now present in the water. The bait was prepared: tuna gills! Whilst chumming is seen by some as an unfriendly practice when it comes to shark viewing, I was very pleasantly surprised at how little chum was used to attract the sharks, and how tamely this was deployed. The bottom cage was winched off the top deck. Once free it was readied to dive. The first shark was sighted. It was not the black shadow lurking in the depths that I had expected to see, but more a golden brown glow gliding through the water checking out these strange creatures above. 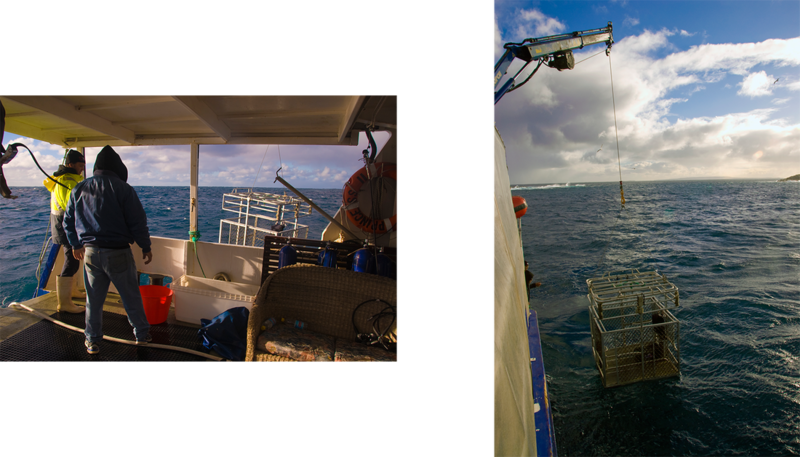 The surface cage was deployed and divers began suiting up for the 11 degree water. There were walls of trevelley amongst the washing machine of the turbulent ocean surface. And then the sharks appeared. Images such as the one below are frequently what we see in the media when great whites are mentioned. Fast action, swirling water, snapping teeth. As someone who prides themselves on their knowledge, albeit small, of sharks, even I was taken aback by the lack of rapaciousness of these creatures. Their gentle manner betrayed their innocent curiosity. Sharks are the most perfectly evolved creature on the planet. I was once told that in human terms, sharks only require one hamburger a week and when you think of this, the idea that they are a fast paced action killing machine just doesn’t fit. By chasing every living thing around the ocean, a shark would soon deplete their energy reserves, and so it should have come as no surprise to me that great whites spend the majority of their time slowly cruising around, watching and waiting. When we did see fast paced action as in the image below, the bait was rarely taken. 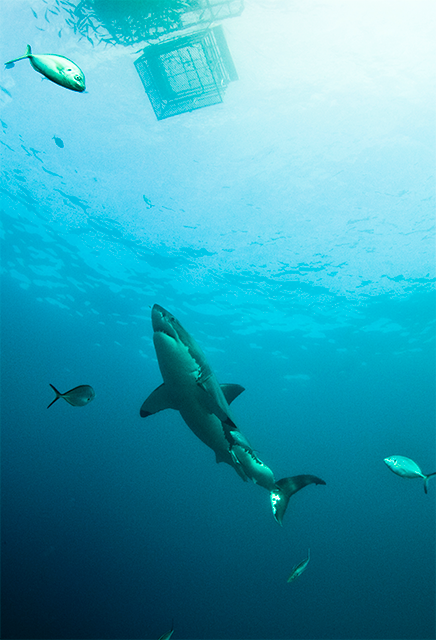 More often than not, the shark nudged the bait with its snout or gave a swim past checking it out with their dark eyes. A classic fin shot at sunset. Notice the beautiful colour of this great white whose skin shimmers like gold. 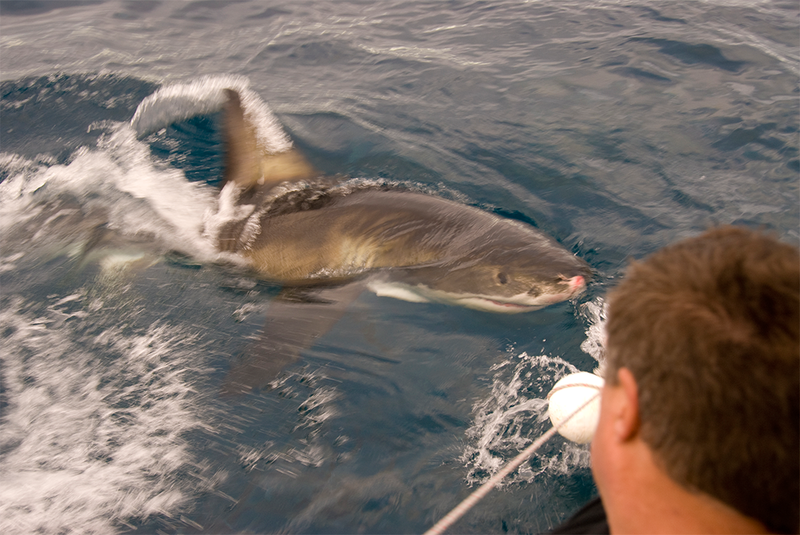 The marks on its body are bite marks from a confrontation with another shark. We received many a swim by from these graceful animals. Below the water, we could really get a feel for the size of the shark and look for identifying features on the body that allowed us to pinpoint the specific shark we saw. Despite having such a wide bite, notice how gently this shark is taking the bait. There is no white water, no snapping jaws and no thrashing tail. Looking up from 14 metres under the ocean towards the surface cage. I deliberated about posting this image but decided to as its one of my favourites from the trip. This is another classic shot that is commonly misinterpreted in the media, but before you assume what is happening here let me fill you in a little…..Whilst in the bottom cage we were visited by this magnificent girl who it turns out is a new visitor to these waters. During the course of a day we humans use our hands to gather a large amount of information: hot or cold, hard or smooth, soft or firm, wet or dry, malleable or rigid and the list goes on. Sharks on the other hand have no external appendages that they are able to use to gather this information and so they use the next best thing – their mouths. This beauty was not trying to break into the cage, nor was she trying to eat us. We were not tossed around inside the cage and she didn’t shake her head side to side like a feral dog. In fact, what she is doing here is figuring out what on earth we are. We are an anomaly in her world and she is feeling the side of the cage to work us out. 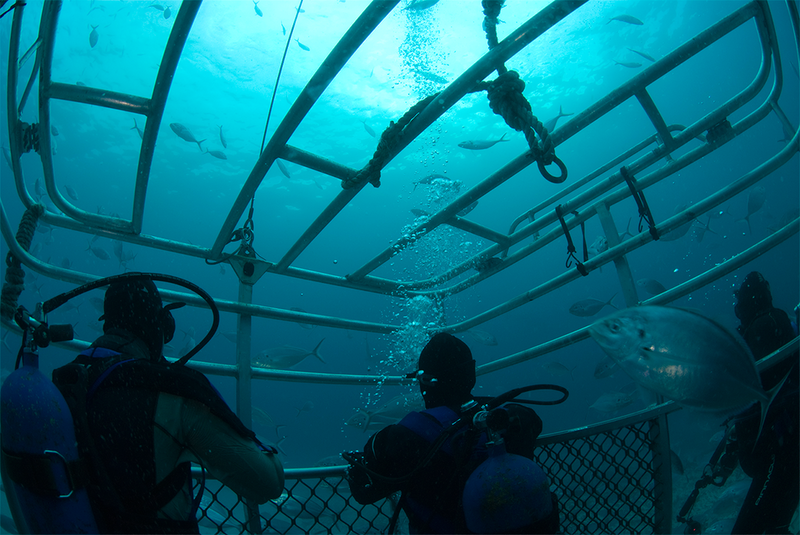 Cage diving can be seen as a little controversial by some as it is seen as damaging to the sharks. I had this in the back of my head whilst I was diving here, but I am very happy to say that this is not the case. This was the only shark that mouthed at the cage and she was very gentle in doing so. Although very occasionally other sharks may have bumped against the boat or the cages, there was no damage caused to either. 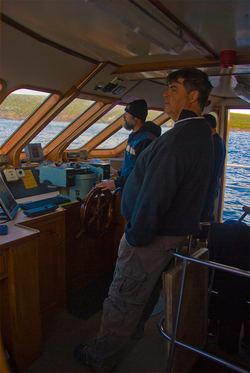 Andrew and the crew were very responsible in their duty to entertain their charter and keep them safe, but they didn’t do so at the expense of the shark. The shark came first and I was more than happy to allow this to be so. Rising to the surface in the bottom cage. 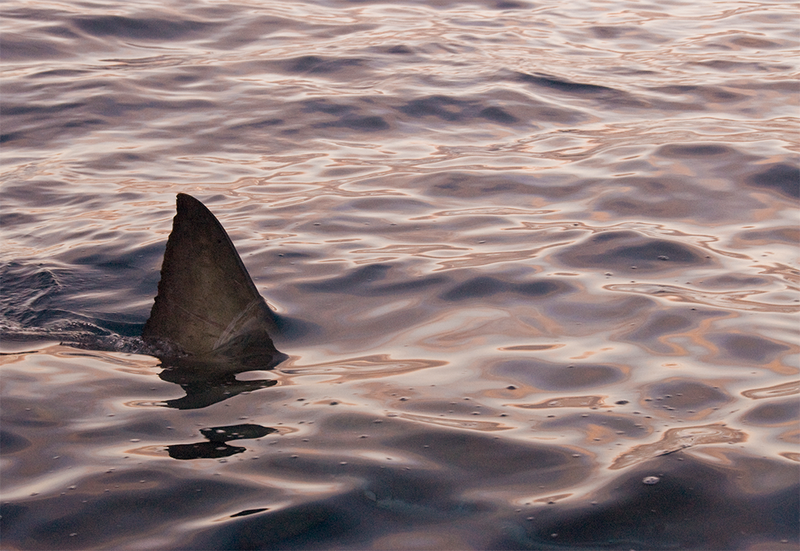 Sunset came too soon, and with it the possibility of tagging one of the ‘Super Sharks’. Sadly by this point we had lost our appeal to the sharks and didnt get the opportunity to tag the big boys. There was time for one last quick look before we returned to harbour. Whilst very different to the isolated location at North Neptune, the marina at Port Lincoln showered us with its own beauty. 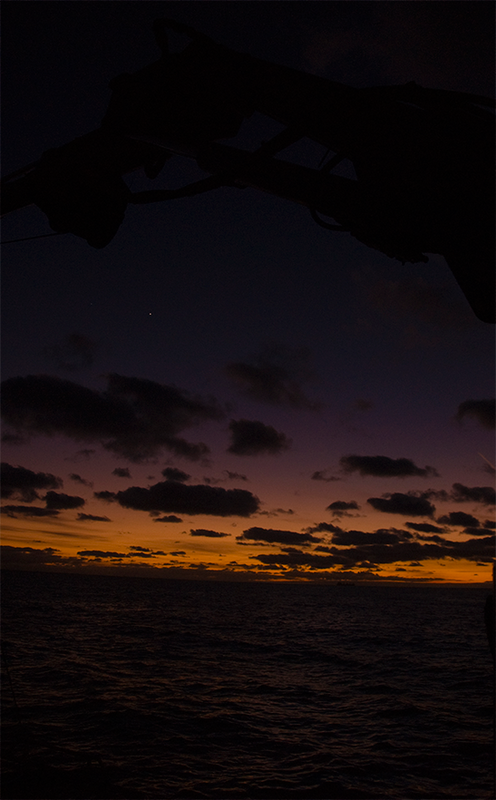 The multitude of lights from various fishing vessels lights up the nights sky. Our dive boat dwarfed by the larger ocean going fishing fleet. We found the sharks, and everyone came away very happy campers, eager to visit North Hopkins Islands and the Rodney Fox Shark Dive crew again very soon.